Welcome to the show my friends! I was struggling to find a good theme for these next couple of months which would bridge Thanksgiving, Christmas and New Years but nothing seemed to fit. Then a stupid title kind of fell on my lap. Okay, my dog gave it to me but still, it was a struggle. This year I am launching the Holiday Hell Show and it is incorporating everything silly and fun that a mid-30’s guy should not be involved in. I plan to have lots of fun with this especially since I feel like I missed most of the Halloween season. I imagine this is what an estranged and neglectful father does in his twilight years to his kid. Let’s do everything!!! Today I was checking out the local CVS for their holiday loot and found a line of Snoopy (Peanuts™) products. The one that stood out the most was a hot dog toaster that not only toasts the bun but the hot dog too! The idea of a cartoon dog on a toaster that also cooks meat was almost too much. And those on Twitter agree since my picture of it was retweeted almost thirty times. 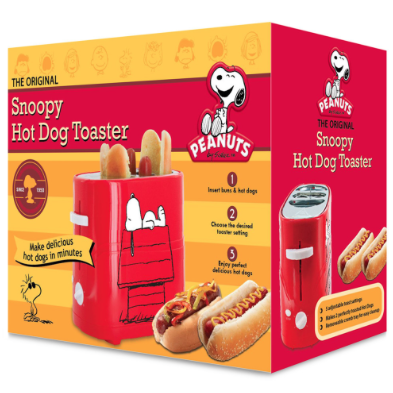 There’s definitely a market for hot dog toasters. Come check out the first of many Holiday Hell Show posts. I cook hot dogs in my office. This all seems so right. Well at least I am not alone in the fact that I would totally burn the hell out of myself on this thing if I had one. This a strange little gaget to say the least!